Wall chalkboards are designed for a variety of uses. School classrooms are some of the most common places to find chalk boards being used. Often times, teachers will write out their lesson plans, or utilize the black erasable surface to have children practice their writing skills. Professors can call upon individual students to come up to the wall chalkboards and write a sentence, or draw a picture. Write-on boards, also called black chalkboards, mostly come with either a black or a green writing surface, though some other colors may also be offered. Black dry erase boards were originally constructed from smooth, thin sheets of slate, while modern versions, such as the ones seen above, are made from other types of materials. These wall mount chalkboards feature a textured writing surface, versus others designed using porcelain, which have a magnetic surface. Magnetic blackboards are especially ideal for use in a school classroom. 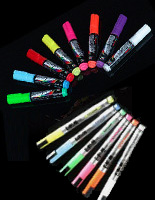 As a result of the writing surface, the wall chalkboard options seen here are ideal for use with liquid chalk markers, as well as standard stick chalk. 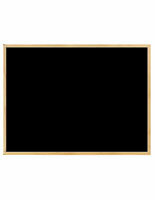 Other than in a school classroom, where else can framed chalkboards be used? 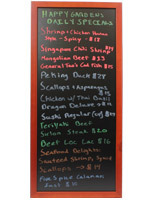 Black dry erase board can be used within restaurants and food service locations. 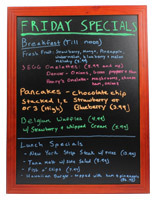 Framed chalk boards, when utilized in these types of locations, are often used to display specials or recent additions to the menu. 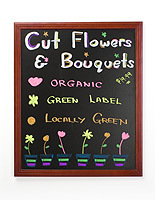 These wall chalkboards are the ideal preference, as messages wipe clean in a matter of minutes. Restaurant workers can easily change the displayed lunch specials to dinner specials by simply using a damp cloth to wipe off the written messages. Wall chalkboards are sometimes utilized in an office conference room. These black dry erase boards feature an upscale wood design and are ideal for placement in even the fanciest office. Business people often use the write-on boards during a meeting to illustrate a point or to write out key facts. Once the meeting is over, employees can wipe the written message off before the next meeting. The write-on board can also be used to display a memo or other important information. 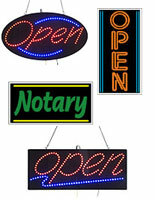 These message display signs, no matter how they are used, are sure to benefit your office setting. Bars and nightclubs are yet another location a black write-on board can be used. These products can be used to display drink menu specials or advertise an upcoming promotion or event, such as a guest DJ or charity fundraiser. Bars and nightclubs can be exceptionally busy locations, where time is of the essence. There is no need to worry about timely message changes with these write-on boards. Simply use a wet cloth to wipe off your old messages, and new messages can be written in mere seconds! These write-on boards also enable users in these types of arenas to create customized messages. With an extended budget, local artists could draw more detailed and eye-catching signs to generate more customer interest. Unlike a bulletin board, which is much more generic, these memo display signs are sure to attract attention! Residential settings could also make use of these write-on boards. At home, children could use these products to draw and write messages in their bedrooms. They could also use the write-on boards to play "school" or "house", and pretend they are a teacher writing out a school lesson. Chalkboards could also be used in residential settings, specifically in the kitchen, for writing shopping lists or other things to remember. Their decorative framing enables these products to look more like a frame and less like a chalkboard, making them even more ideal for use in this type of setting. With so many black chalkboard products on the market, it's hard to decide which ones to buy and where to buy them from. Why should customers buy these write-on boards, over others on the market? These black chalkboards feature a unique writing surface, most of which accept regular stick chalks, as well as liquid chalk and wet-erase marker pens (dry erase marker pens will not work with these menu signs). Write-on boards with a mahogany, natural wood or matte finish are available, for use in several settings, including those with an upscale décor. Several black chalkboard sizes are offered to suit the needs of any business owner. These write-on boards are designed for wall mount use, enabling users to display messages up high for patrons and customers to easily view the displayed signs. These products come with a "order today, ships today" guarantee, when in stock. As with many of the other products found on this website, if the product is in stock, simply place your order by 3PM Eastern Time US, and the product will ship out the very same day! This fact alone is why more people choose Displays2go.com for all of their chalk board display needs. Besides these black write-on boards, what other options are available? A-frames are ideal for use outside of a restaurant or business. These outdoor displays are sold both with and without header areas, to further promote and advertise your services or specials. Signs with a green writing surface are offered for use specifically in a school classroom. Combination displays are also offered, which feature a cork surface for tacking up a memo and writing out messages. These write-on board displays are designed for wall mount use. Some menu chalkboard styles come with mounting hooks attached to the back of the frame or pre-drilled holes for users to quickly and easily mount the products to their wall. 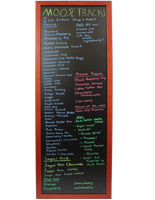 Wall mount menu signs are ideal for places with restricted counter or floor space. By displaying your signage up high on a wall, your messages will reach a greater audience, as they will be easier to view by many more patrons and clients. Due to the size of some of the black board products in this category, we recommend a professional installation. 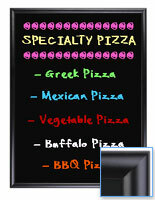 This ensures your menu signs will be both level, and the proper hardware is used for a sound installation. In addition to the wall mount blackboards seen here, a-frame chalkboards with a natural wood finish or mahogany finish are also available for purchase as well. These menu signs are ideal for placement outside of a restaurant or business. 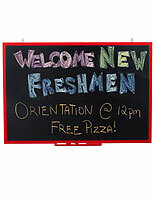 When placed outdoors the chalkboard a-frame can attract customer attention and lure patrons into your business! These products come in a variety of styles both with a black writing surface and a green surface. The traditional chalkboard a-frames with a green writing surface only accept standard stick chalks. The deluxe blackboard options are ideal for use with wet-erase marker pens. For customer convenience, these marker types are sold separately, in a variety of thicknesses to draw bolder or thinner graphics and lettering. These menu displays are stocked by the hundreds in three large warehouses for quickened shipping. As with most of the other products on this website, if the black board is in stock, place your order by 3PM Eastern Time US for same day shipping. This site offers some of the shortest shipping lead times found anywhere on the web. No other online suppliers can compete with this type of service. In business for over 40 years, Displays2go has become a leader in supplying quality products, for office, school, restaurant and business use. The product selection includes a variety of marketing displays, including magnetic dry-erase frames, black board displays, bulletin noticeboards, marker board products and more. With most products stocked by the hundreds, you'll have your order in no time. Buy quality displays online today from this trusted leader.